The SKB-DH3315W Mid-sized Drum Hardware Case is a rotationally molded of Low Linier Polyethylene featuring a telescoping lift-off cover design with ergonomic built-in handles and nylon web cinch closures. With an injection molded pull out handle and built-in roller blade wheels this smaller hardware case will go anywhere. Perfect for the gigging drummer, the SKB-DH3315W Mid-sized Hardware Case can easily fit in the back seat of a car. 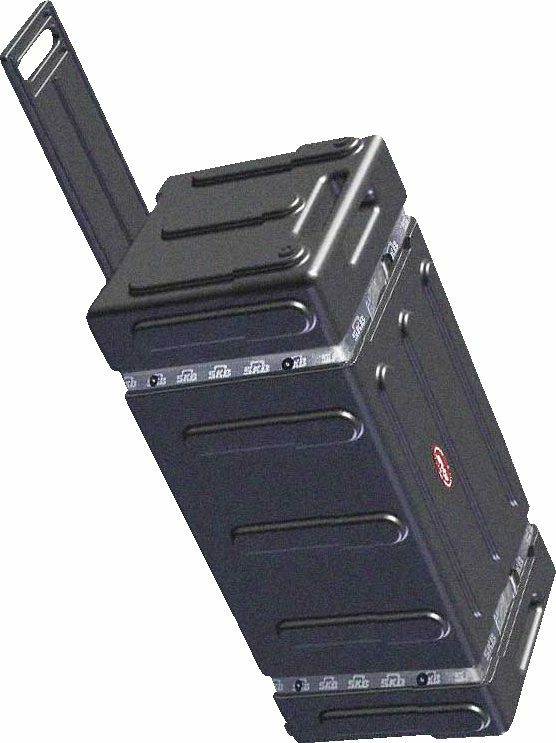 The SKB-DH3315W Mid-sized Hardware Case is covered by SKB's Million Mile Lifetime Warranty. Overall: Great product, holds a lot of gear and makes it easy to transport. The handle and wheels make it really nice to move my hardware. The only things I would like to see different are the molded handles should be on the lower half of the case so you could use them with the lid off. Also it would nice if it were a couple of inches longer. I need to unscrew the hi-hat pole and close down the tops of a couple cymbal stands to make them fit, so there is a little more tear down and setup than I had before using gear bags. I also think its a little overpriced, but I might end up buying another one because rolling all the heavy hardware with the retractable handle is much nicer than carrying gear bags!! Overall the quality is very nice and the ease of use is amazing! Overall: Life saver, I used to lug my hardware around in a hardware bag, very heavy.Switching to the SKB case was a great move, very easy to transport and easy on the back.I should have invested in one years ago.